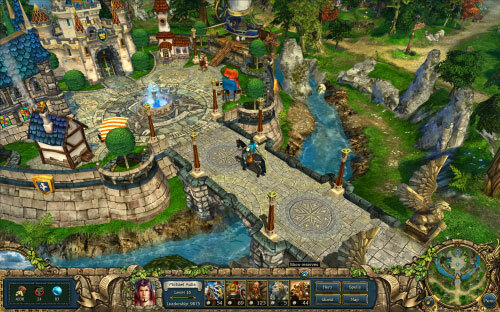 It’s also very similar to the “Heroes of Might and Magic” series some years back. However, to simply say that King’s Bounty: The Legend is a remake of an old game is an understatement. In King’s Bounty: The Legend, you as a hero, have to choose between the game’s available 3 classes: a Warrior, a Paladin, and a Mage before you start. You’ll start as a hero, served under the King of Darion. Your mission is to practically “save the world” and maintain peace in the region. You will not have companions to travel with you, but you can bring a group of armies with you. 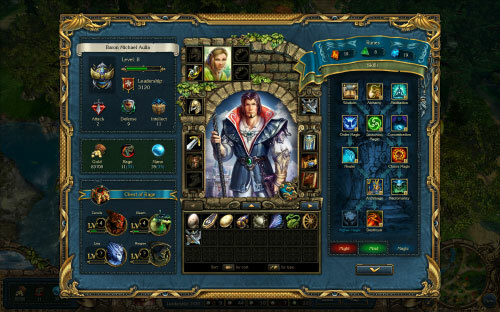 King’s Bounty: The Legend is filled with humans, elves, dwarves, orcs, the undead, and other magical creatures. These creatures are available to be recruited, assuming you can find the place to recruit them. Unlike the old King’s Bounty and the Heroes of Might & Magic series, you don’t own a castle, you don’t build buildings that host these creatures, and you don’t control any other characters beside yourself. 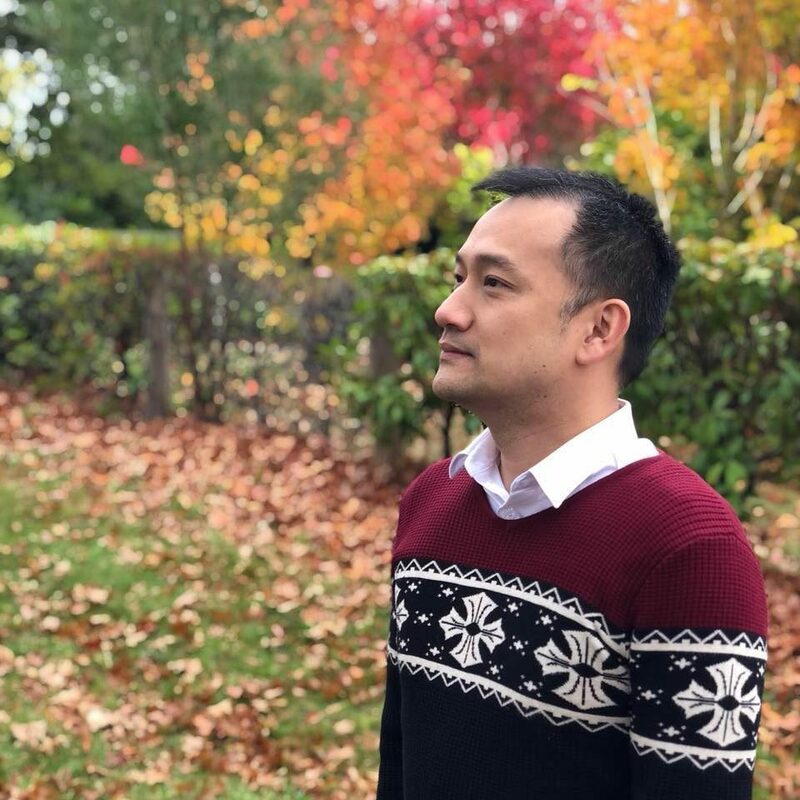 You will travel from land to land (using your “never-get-tired-horse”), sea to sea (using a boat), and world to world (using Dwarves’ advanced technology – I won’t spoil the surprise here). You can recruit up to 5 types of armies and bring them along with you to battles. You will not be directly involved in the battle (besides ordering your armies around and throwing some spells), meaning, you cannot die even if you lose the battle. The battle scene is separated from the game world, so when you encounter an enemy, the game will take you to a separate “arena” and the battle is turn-based (where as you travel in real time). Of course, recruiting armies do not come for free. You’ll need money and the resources are not unlimited. The available stock of armies will replenish every time you progress with the main storyline, though. Besides gold, there are also a few different types of magic crystals (for upgrading your spells and your hero’s skills). You can find these lingering around on the map (and most of the time are guarded by enemies) or get them from quests and other special places. The location of the enemies and resources are randomized every time you start King’s Bounty:The Legend with a new character. This will give you practically unlimited replayability, but it comes at a cost. Because of the randomness, you’ll often encounter enemies that you can’t defeat yet on low-level areas or even when you just start the game. Thank goodness that sometimes you can simply run away or avoid these enemies on the map. Sometimes, you can even out-maneuver them to get through. A simple right click on the enemy will predict whether you can or cannot win the battle (based on your armies strength). The graphics, as you can see from my screenshots, are beautiful indeed. You can see more screenshots and the workarts on King’s Bounty: The Legend official site. In fact, the graphics are so good that sometimes you can’t differentiate which are the backgrounds and which are interactable objects. 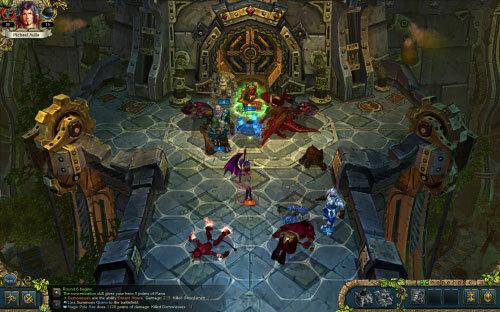 King’s Bounty: The Legend is colourful and supports most of 3D effects such as dynamic colored lighting, pixel shaders, etc. On my GeForce 8800GT, King’s Bounty: The Legend’s display settings can be set to High without any performance suffer. You have the primary quest (marked by a crown symbol on your quest log) and also lots of side quests to bolster your hero’s level, spells, and resources. The good thing is these sub quests will keep you pre-occupied, much much more than the main quest itself. You’ll be busy travelling back and forth to accomplish these quests. Unfortunately, you can’t jump into towns and castles, so you’ll have to rely on your horse to travel. It can get tedious but thankfully you can create your own note on the map. It’s good to do it because often the quests don’t give clear indicators on where the quest givers are located and you’ll have to rely on your memory, your custom map notes, or your luck. Often I completed a quest, only to get lost because I forgot where the quest giver was located (the log book only said “Return to Mr.X for your reward”). The problem is I forgot who and where Mr. X was and had to spend 5-10 minutes trying to find where he/she/(and it) was. The sub quests are quite varied, although sometimes they can get a bit cheesy with the dry humour. Nevertheless, it’s fresh and better than just “Kill a number of X creatures” kind of quests. As said before, the battle/combat is done on a separate battle scene, or they call it “Arena”. Each arena is divided into hexes (think of it as a Chess Board). Each unit has its own position on a hex. Depends on each unit’s speed and abilities, range of movements and attacks are varied. The battle will be divided into rounds; One round means every unit on the arena has done its move. The battle is turn based and the system will decide who will go first depending on the type of creatures participating in the combat (based on the “Initiative” attribute). Most of these are common sense, though. A “magic flying mosquito” has a better initiative and can certainly move farther than a “big fat giant”, for example. Almost every creature type has its own abilities. 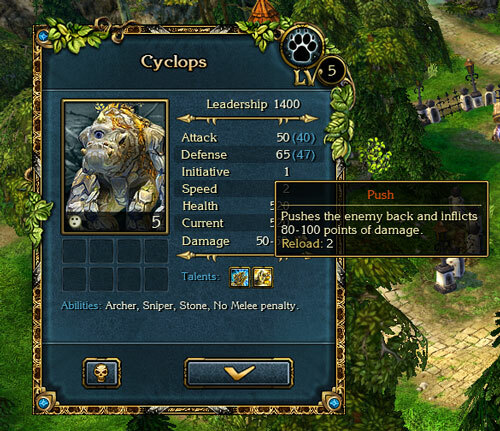 Some of these creature abilities can only be used once on every battle and some can be re-used after several turns of the battle. There are tons of spells for you to play around with. If you choose your character as a Mage, your spell power will also increased, since your character has a boost of attributes and also the higher skills specialized for magic. The spells artwork are top-notch and so do the effects when you cast it on screen. You can also upgrade your spells from your Spells book, if you can find where it is without reading the manual. It took me a while to figure out how to upgrade my spells after much later in the game (I failed to notice the tiny “up arrows” next to the spell as it’s very well blended on the book’s background colour *doh*. Later in the game, you’ll be able to have the 4 Spirits of Rage to serve under you. Think of these as your summons. Each spirit (or summon) has different requirements to unlock them and also different set of skills. They’ll gain experiences as you use them more in combat and also level once they’ve reached a certain experience point. 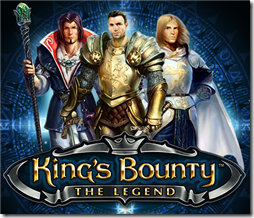 King’s Bounty: The Legend is very addictive. It’s the kind of game that will keep you hours of playing without you realizing it. There are plenty of quests available to keep you occupied from time to time. Although the main storyline of King’s Bounty: The Legend is not the best storyline out there, the interesting combat, the sub-quests, the variety of creatures, and other supporting features that I haven’t mentioned here are truly what make King’s Bounty: The Legend shines. Next articleThe Slimmer the Better?